This week has been so long and grueling. I've been slaving away at work basically every day and night now and it's not even over. It's just been the cat and I snuggling into bed every night and falling asleep to an episode of Pushing Daisies. I'm slowly making my way back into the real world. But that's not what's important here! What I really want to say is thank you to Starr, of A Thought Is The Blossom, for letting me feature a giveaway on her site and to everyone who is participating in the giveaway and has become a recent follower! I've only had this blog for a little while now and it excites me to see that people have taken an interest to it. Once this week is over I'll get back to my regular routine of posts and keep this thing updated with fun photographs and outfits. Hi Arielle, I can't tell you how much I adore your blog and your style! You have the coolest hat collection I've ever seen! I love all your outfits here, especially the last one! That blue dress with the peter pan collar is adorable! ahh, too perfect! you make me want to cut my hair! When is the event? I'll be at the photography studio with Carolina, if you're free then, you should join us! I saw your giveaway on Starr's blog and of course I had to enter. You have the best hats, I can't believe you're giving away a hat!!! I saw in one of your photos that you had that boater too! Yay high five. When I saw it at Forever in April, I flipped out! I was like OMG OMG I WANT I WANT :) Yes let's definitely meet!!! Hi there, I'm glad to have happened upon your blog. I've recently become addicted to buying & wearing hats so I'm excited to see how you style yours. Looking forward to your next post(s)! oh my goodness that last outfit is spectacular!!!! and i love your lamp in the first photo! you are so cute! the first look is amazing - the shoes... they are a dream!! 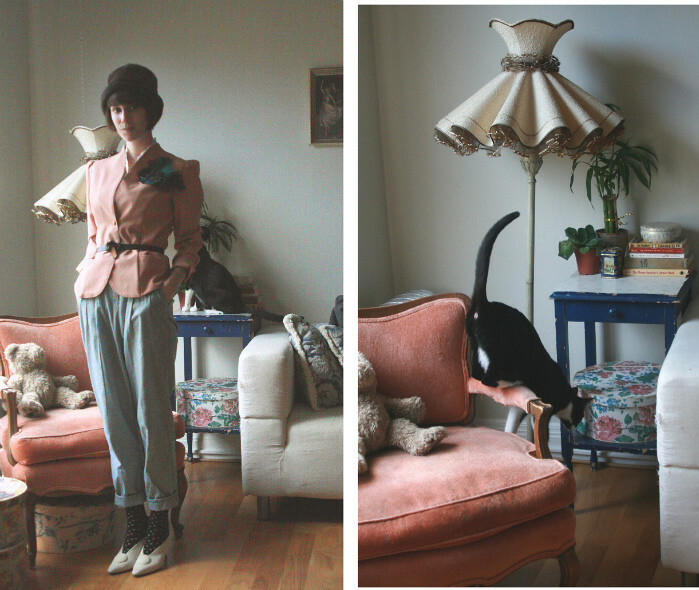 I just came across your blog yesterday I think and I fell in love with you, your cat and your amazing hats! I think people should wear more hats, they are just so underrated nowadays. 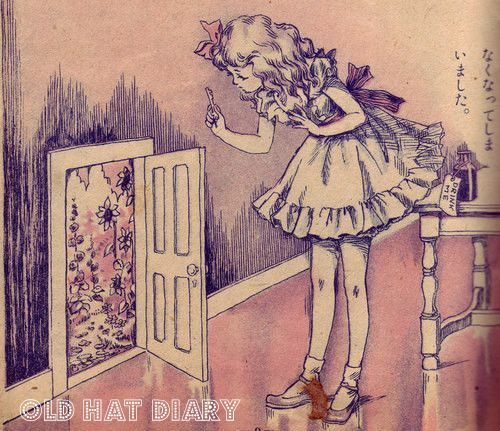 Maybe more people just need to have a look at your blog, I know I sure want to wear more hats now. You have the most wonderful style, I adore it so much. And I too think that nice cheese is just the best. Now that I've creeped you out with all these compliments I think my work here is done. 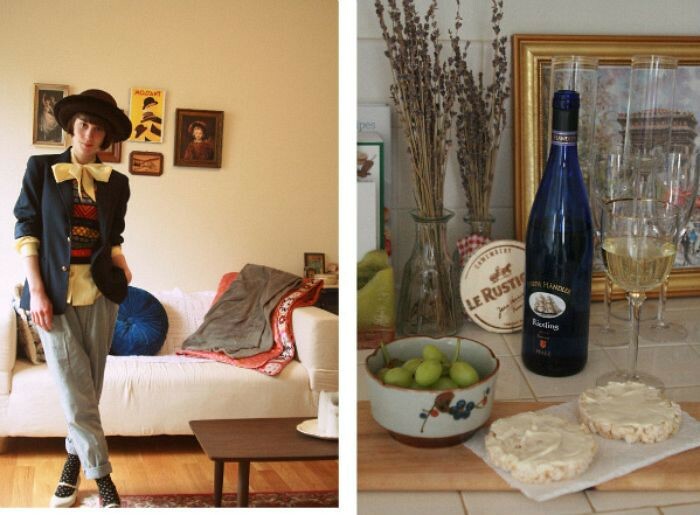 Ugh your apartment and style is so perfectly Parisian. I am so jealous!! I found you through Starr! Your style, blog and place are amazing. Not to mention your awesome hair and beautiful hats!!! yay! i just found your blog and am too happy! you're style is impeccable! you make me wish i still lived in sf! Ps: I'll be having an amazing giveaway soon, stay tuned!